With a new WHL season bringing a new look for the Royals both on and off the ice, our team set down to work on a concept that would highlight the club’s connection to the community. Drawing inspiration from a past Brandon Wheat Kings video, the team’s game day staff suggested weaving a common thread through some iconic locations on the South Island - bringing the passion from the neighbourhood street to centre ice. It didn’t take long before we settled on the idea of a blue spark that would streak through a number of locales before arriving at the Save-on-Foods Memorial Centre for puck drop. With that notion in mind our team spent a late summer weekend collecting shots from around Victoria, Saanich, the Westshore and even the Cowichan Valley - carefully leaving empty space in each scene for our blue streak. Then, once back in editing, the real work began. After tracking the movement of each clip in Adobe After Effects, we designed our beam of light and created custom motion effects for each location. Once the streak was laid into place, the next step was to mask out any foreground objects frame-by-frame, giving the graphics a more authentic look as the ray of light dips behind trees or around a bend. It was nearly a week of adjustments and fine tuning on the city scenes before our attention turned to the always action-packed highlight sequence. With a fitting track from Monster Truck (‘New Lion’) as the foundation, we’re really happy with how this latest Royals intro video came together. This was certainly an outside-the-box idea, but when you’ve produced several years’ worth of videos for the same organization, it’s always nice to keep things fresh and dynamic - and the team didn’t seem to mind, starting the year with a 5-0 record on home ice! With the cherry blossoms emerging across the city, it was time to hop on board the Victoria Royals postseason bandwagon for another year! 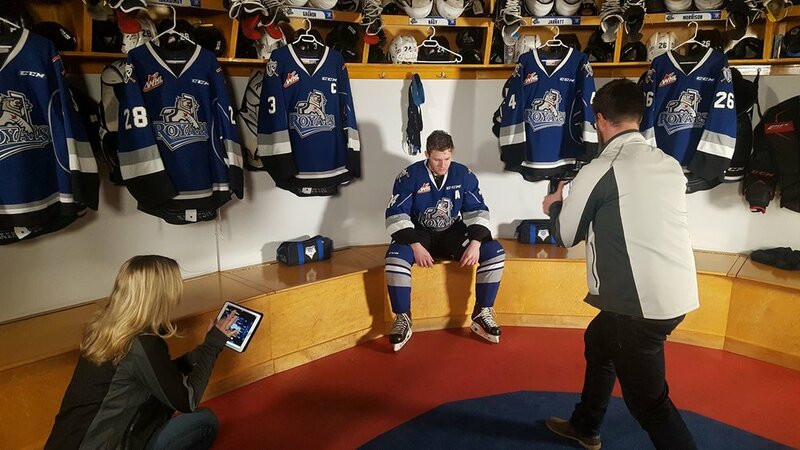 After producing a number of intro videos that were very player focused, our creative meeting with the Royals communications, marketing and game-day promotion teams led to one conclusion - it was time to put the spotlight on the fans! So with that concept in mind, our team set out to tell the story from a new perspective - but we knew that we needed an attention grabbing shot to open the video. For that, we turned to the team at Townline Properties for an assist - looking for access to the rooftop of the new condo building across the street from the arena! In the meantime, our crew attended four games over the course of three weeks to collect images of fans filing into the rink, getting some motivation from Marty the Marmot, filing into their seats and preparing for puck drop. By using a mix of smooth gimbal shots and close-ups of fans, we really wanted to set a fast pace as the music builds. After two cancellations for wind and snow (what happened to spring in Victoria? ), we finally set up our timelapse shot atop the Hudson Walk tower and had our opening scene in the bank. Then, with our unanimous music choice (Nothing But Trouble by The Lazys) in place, it was time to weave all of our footage together into 92 seconds of energy to get the playoff crowds on the edge of their seat! New to the plan this year was a series of playoff teaser videos that the club could use in their marketing campaign - and once again, we decided to turn the camera on the fans. Using the team's ONE GOAL slogan for this playoff run along with footage collected for the main intro video, these clips were a quick and easy way to give the team another tool for their ticket sales push. As always, this project was a blast to put together. We can't wait to see how deep the Royals can take this city and their fans into the WHL postseason this spring! For our latest project with Victoria’s WHL squad, we developed a concept that focused around the little moments before the opening face off when players get their game faces on ahead of the puck drop. By overclocking our Panasonic GH4s to shoot at 96 frames per second, we were able to capture all of our pregame scenes in super slow motion. This gave our footage the dramatic tone we were after. 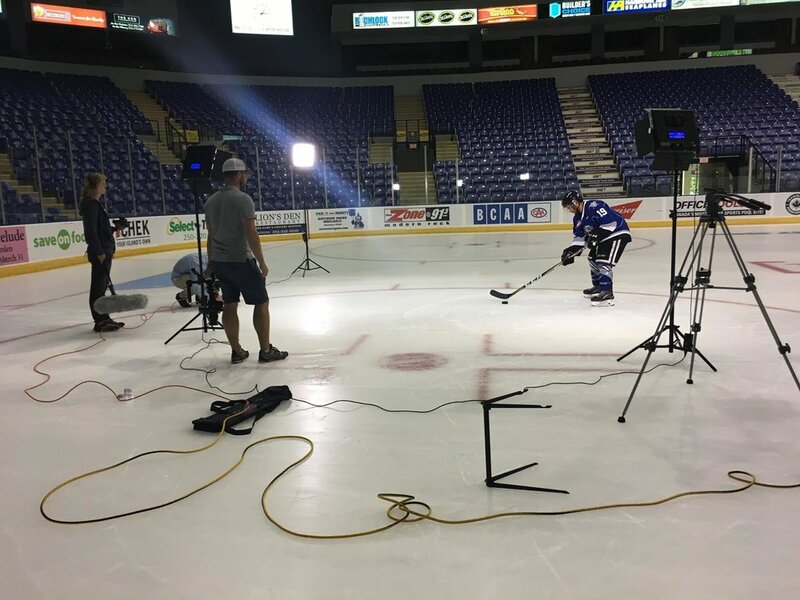 Our crew also took the time to bring our LED panels out onto the ice with the players, giving us the dramatic lighting to match the mood of the video. The ever-patient players went through their usual pregame routines from a warm up skate, to a swig of the water bottle, to standing in the anthem line-up. We even had a little help from the players themselves who helped capture audio by being our microphone boom operators. Those on-ice sound effects play a big part in the final edit. After about an hour on the ice, we shifted to the tunnel for our favourite shot of this video: Royals forward Ryan Peckford walking out of the smoke at the start of the game (thanks to Mike for his Halloween smoke machine that was put to the test)! Then, with The Pretender by the Foo Fighters as our soundtrack, we assembled the hardest hitting highlights from the 2016/17 season, collecting the hits, saves and goals that make Royals hockey a blast to take in live. We can’t wait to see how the team fares on the ice and hope we’re back to produce another playoff video this spring! 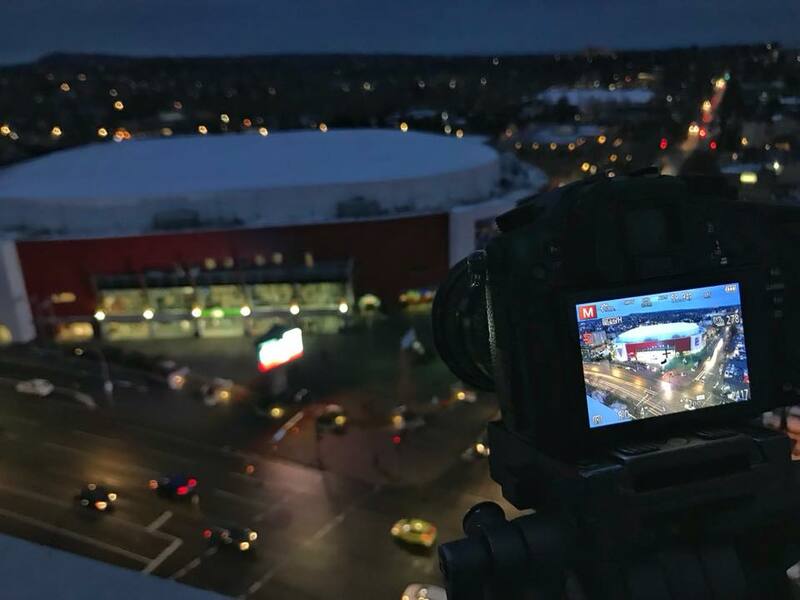 With the WHL regular season once again drawing to a close, we were asked to produce a new version of the Save-On-Foods Memorial Centre intro video that would help usher in the playoff campaign for the Victoria Royals. With a postseason theme of 'Unfinished Business' and veteran forward Regan Nagy selected as our star, we began working on the storyline. We decided to show Regan in the locker room at intermission, visualizing his performance before stepping back out onto the ice. We accentuated his focus by placing him alone in one corner of the room. Using a series of ultra tight shots and quick edits, we tried to increase the intensity as Regan initially has a hard time finishing the play in his mind - but ultimately his mental persistence pays off. By collecting some live audio at a Royals game we were able to simulate the arena environment at the start of the video, and also get some key slow motion footage for later in the sequence. In order to achieve the dark and series tone in the final product, we used our LED light panels to cast moody light in the room. Then in editing we layered in some film grain effects to really enhance the gritty feel of the scene. As always, we tossed in some of our favourite highlights from throughout the Royals regular season - and just like that the tone is set for another run at the league championship. Without question, some of our favourite projects involve showcasing the local athletes that Victoria has to offer - especially when we get to show off our work at the start of every game at Save-On-Foods Memorial Centre! This year, with the Royals’ heartbreaking loss to the Kelowna Rockets in the Western Conference semifinal, a new storyline was created: redemption. Having played his entire five year career in a Royals jersey, veteran Ryan Gagnon took the spotlight in this season's intro video. Accompanied by strength and conditioning coach Jeff Compton, we took to Victoria’s beautiful Arbutus Cove at the crack of dawn to capture an entire team workout with the playoff upset still very fresh on their minds. Keeping pace with a fit young athlete is a challenge in itself, let alone attempting to capture a steady shot while doing so. In order to ensure that the footage was smooth and steady, we mounted our GH4 to our Allsteady Motion gimbal as we followed the team throughout their (and our) workout. Throughout the planning process, we really wanted to ensure this story had a cinematic look and feel. This required carefully intertwining the morning routine with flashbacks of last spring to acknowledge the upset that happened on the ice, and turn it into a rallying point for this season. From leveraging the morning light to a carefully selected song (Little Black Submarines, if you're curious) - we knew it was crucial to set a tone that would resonate with fans and players alike. Time to sit back, turn up the volume, and take a ride on this emotional roller coaster - and as always, Go Royals Go! With the club heading into the WHL playoffs as regular season champions for the first time in franchise history, we knew we had to take our game to the next level as well. We decided to go inside the mind of captain Joe Hicketts to capture the pre-game routine of a Royals player, and give the fans an inside look at the locker room leading up to a postseason battle. To accomplish the point of view shot, we had to put our creative minds to work. We wanted an image of the highest quality, and also a shallow depth of field - which ruled out the use of a GoPro camera. So our attention turned to building a custom head camera rig, using an old baseball helmet and some parts we picked up at the local hardware store. Once balanced with a couple of 2.5 pound counterweights, the rig was perfect for capturing the proper field of view. With the help of the Royals game-day and communications staff, we then went through the motions of a pre-game routine, all while monitoring the shot from our Panasonic GH4 using the wifi app. From taping up a stick to hitting the ice with the rest of the team, we're thrilled with how the concept came to life. We combined those shots with some excellent footage of the Ed Chynoweth Cup courtesy of the WHL head office, and mixed in our favourite moments from the 2015-2016 season. Now we'll take our seat in the stands and cheer the Royals on as they go for the title in 2016! With the club hitting the midway point of their season and climbing to the top of the WHL standings, we released a second version of our jumbotron intro video. This time is was sophomore defenceman Ralph Jarratt stepping into the spotlight in our lead role. We also introduced a whole new batch of highlights from the first half of the Royals regular season, to give the familiar video a fresh look. Now our attention turns to the playoff intro, which is already in development! Hopefully we can give the crowd and the team a little extra energy before they take to the ice in search of a WHL title! We teamed up with the Royals staff to produce a video to play on the arena jumbotron before each and every home game this season. Of special significance, the club wanted to highlight their fifth season of hockey on Vancouver Island. It was clear that the video needed a storyline to set up the history of the franchise, and we quickly opted to have a player (Jared Dmytriw) on a breakaway, with memories from the past flashing through his mind. We took advantage of our DJI Inspire 1 drone and AllSteady Pro gimbal to capture fluid movement as Jared made his way down the ice. We also grabbed some behind the scenes footage as part of a promotional ticket giveaway. After a couple of hours on the ice, we blended the entire project together with a collection of highlights from the year before. Keep an eye on our Facebook page for the release of our mid-season recut, and a brand new playoff intro for the Royals this spring!